This suite of demos resulted from some rather excitable experimenting with the newly-acquired Noise Engineering Loquelic Iteritas VCO. I had been looking forward to this release, and it didn’t disappoint! These recordings were whizzed off extremely quickly, and no edits were made to the recordings whatsoever. All of the demos are based around the same patch, which is detailed below. For each new recording I added a couple of elements – some extra modulation, or switching to a different mode. Mix processing was kept to a minimum, with some subtle reverb and delay used, along with some limiting and sidechain compression. For demo 01 SS mode was used (“Summation Synthesis”), and only the FOLD & MORPH parameters / CV inputs were used; the second oscillator on the Loquelic was left untouched (no Pitch nodulation). 3. A randomly-triggered 4ms PEG envelope was patched into the VCA’s Linear CV input, producing the spiky rhythmic plucks. 6. The intensity of the various modulations, along with their associated offset controls, were manipulated during the recording. This recording used the same patch as Demo 01, with the following alterations – mainly the addition of the Modulation parameter. 1. The Modulate control of the Loquelic was manually tweaked, and a randomly-triggered Quadra envelope was sent into its CV input. 1. A randomly-triggered envelope was used to control the Damp parameter on the Loquelic. 2. As the recording progressed I experimented with bringing the other cv sources in and out. 1. Basically, bedlam broke out… and I mashed into all available parameters with gay abandon. This could literally go on all night! Summary – this is the best VCO I’ve played with in absolutely ages. 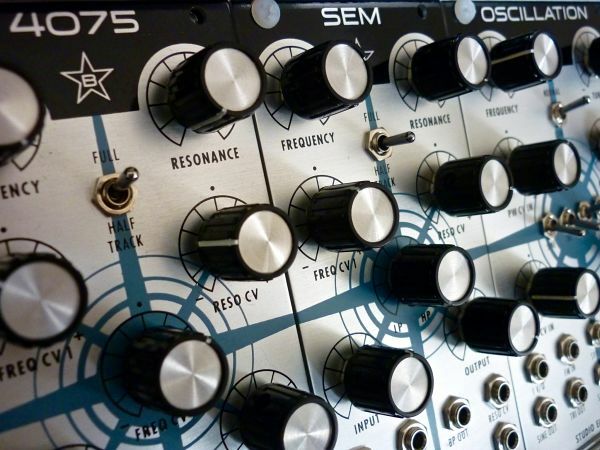 I never, at any point, had to look at the manual to figure it out – and there were very few points where I made unusably awful noises, or went down completely dead ends – which, to me, is the measure of a great module. On this demo I wanted to give a flavour of the various tones and response curves available from the WMD/SSF Amplitude VCA, whilst under control from an envelope provided by the ADSRVCA. The WMD/SSF Blender was also used in this patch. A chaotic rhythmic pattern was patched together, and used to clock the Turing Machine. A PDO mk.2 was sequenced by the Turing Machine, and also synced by a droning Rubicon Pulse, whose pitch was subtly modulated by a second Maths LFO. Four waves from the PDO were mixed together in the Blender, with a slow Maths LFO used to crossfade between the two 2-channel Blend mixers. At 02.44 the ADSRVCA’s envelope length was changed from LO to HI, making it much shorter and spikier. For the last few seconds the Loop was switched on, so that any held (Gated) notes would produce a fast, cycling AD envelope. All in all I’d say that I didn’t hear any bleed from the Amplitude VCA, and it is capable of a very wide range of tones/ shapes – from spiky and clean, to hefty and saturated. The ADSRVCA makes a great companion for it, with some additional features demonstrated in the second demo. WMD/SSF – Amplitude & ADSRVCA by Matttech Modular Demos For this recording I wanted to show off the ADSRVCA in Loop mode. 1. This demo used the same patch as the previous one, but the ADSRVCA’s Loop mode was left engaged throughout. This effect only kicks in when a sustained gate is received (rather than a short trigger), so you will hear little bursts of the looping envelope, followed by a series of normal single hits. 2. The ADSRVCA was set to a very short envelope length, producing an almost AM (Amplitude Modulation) effect at times. 4. As with the previous demo, during the recording various controls were tweaked: ADSRVCA’s envelope settings; Amplitude’s Gain/ Saturation, CV Level, Offset and CV Response. In this demo I wanted to demonstrate some interesting use of the WMD/SSF Blender mixer & VC-Crossfader module. I have used it to mix together 4 different oscillators, using the output of the mixer to sync some of them in a bizarre feedback loop. Screaming oddness was achieved fairly easily! 4. Initially only one channel per mixer was used, with the Dixie crossfading between them. After a while the second signal of each mixer was brought in, using the manual Blend controls. 5. The output of the Blender was fed into Maths, where its in-built comparator extracted a stream of pulses from it, which came out of the EOR socket. 6. These were multed out to the Sync inputs of the PDO, Cyclebox and Rubicon – so that the blended signals coming out of the Blender would sync the oscillators fed into it. Obviously, as there is essentially a chord coming out of it, the sync is erratic! 7. The EOR “sync source” from Maths was faded in and out via an attenuator, meaning that the oscillators’ syncing was made even more unreliable at points. 9. The Dixie’s frequency was gradually modulated by a slow LFO after a while, adding more chaos to proceedings. Some mild EQ, limiting and reverb was added during mixdown. Blender certainly opens up a LOT of possibilities – both via the voltage-controlled crossfading, and also the manual blending. The module can also be used as 3 independent 2 channel mixers if desired. A great little device! 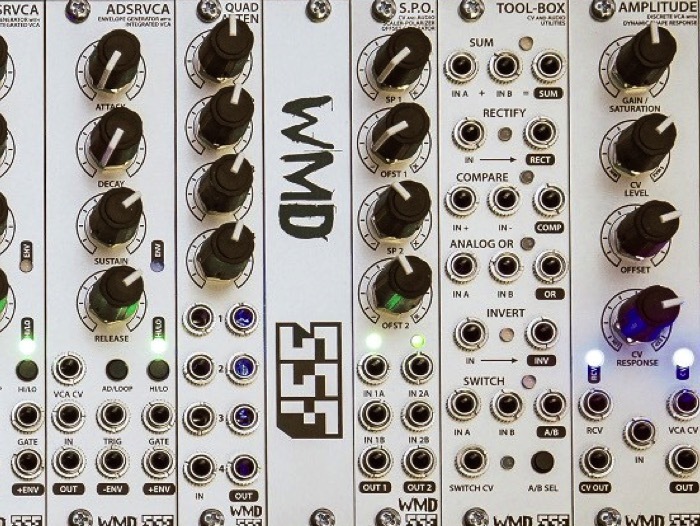 WMD/SSF – Amplitude & ADSRVCA by Matttech Modular Demos Not a musical demo, but instead a simple demonstration of the complete lack of crosstalk/ bleed between the two inputs of the Blend channels. 1. I connected a Rubicon Sine into input 1, and a Dixie Saw into input 2. 3. The Blend control was manually swept from side to side – can you hear any bleed? I can’t..
4. I deliberately wiggled the pitch of the high Saw up and down at points, as this can also be a good indicator of bleed (you notice it more than with a static pitch). Still no audible bleed. Pretty impressive! 2. As with the previous demo, the X-Fade was manually adjusted, and the high frequency Saws were wiggled around to try to provoke some audible bleed. 3. Result – no bleed! Not the most exciting of tests, but useful for anyone thinking about buying one of these, and curious as to how well they isolate sounds between the channels. I know I’ve definitely had crossfaders in the past that DON’T perform so well! 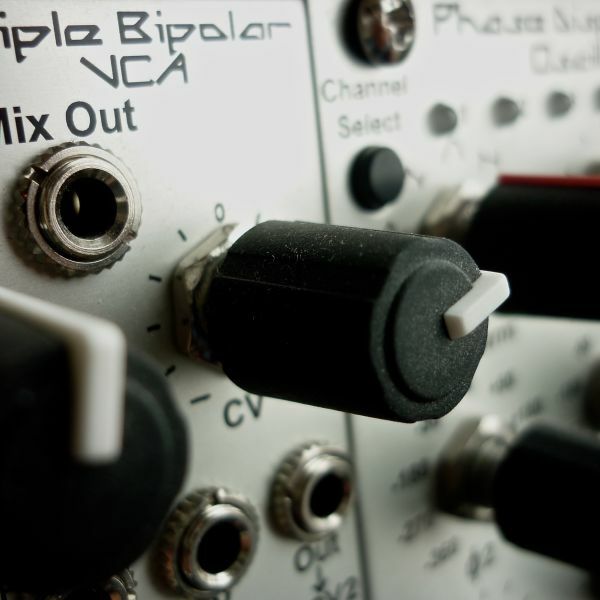 Whilst putting together a suite of commissioned demos for the WMD PDO mk.2 – and associated Triple Bipolar VCA – some of the recordings grew into finished compositions. These are collected within this post. Further demos, demonstrating the PDO’s deployment as a drone machine and LFO will be published soon. This is the first of a suite of demos utilising the wonderful WMD Phase Discplacement Oscillator (PDO) mk.2 and Triple Bipolar VCA. I wanted to do demos that pretty much only comprised the various outputs of the PDO, showing what can be achieved with one instance of this module. I purposefully kept the riffs on these demos pretty simple, so that the sound manipulation becomes the primary focus. The only other synth part you will hear is a deep saw wave bass sound from Native Instruments Kore that was used to underpin the main riff at points (it enters at around 02.17). Everything else is a single recording of the PDO. It actually turned into something approaching a finished track, which was nice! 1. The Moskwa sequencer is providing a sequence to the PDO via its 1v/oct input. 3. Mixer A is recorded direct, and provides a nice rounded bass part – Channel 1 of the PDO is modulating Channel 2, via an envelope-controlled channel of the Triple Bipolar VCA. This has the effect of adding harmonics to the sound, taking it away from being simply a couple of sines. A nice rounded bass tone is produced, and the added harmonics make it easier to hear on smaller speakers – unlike pure sines, which can “disappear” somewhat. Phase Modulation (PM) is very similar to FM in a lot of ways, but without any pitch instabilities. 4. 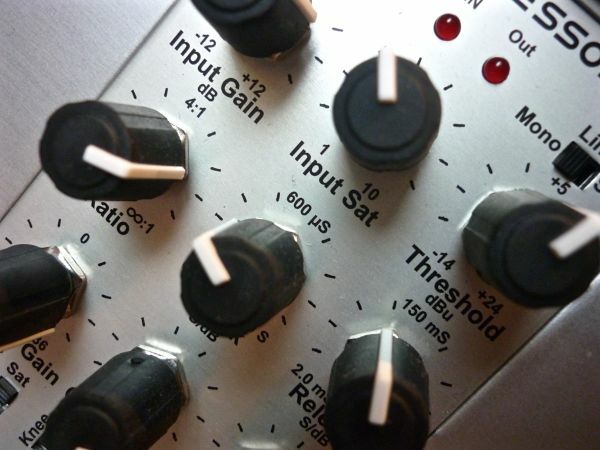 Mixer B – which contains the more “fizzy”, trebly waves on channels 3 and 4 – is sent via the Pittsburgh Filter (In Highpass mode), and then on to the Modcan Dual Delay. This is so that the more “fizzy” sounds appear to be a second, distinct layer to the overall sound, due to their effects processing and delayed timing. 5. The Dual Delay’s delay time and mix are both modulated by the vermona FOURmulator, which is producing slow sines wave LFOs. 6. As the recording develops the various controls on the TBVCA are manipulated, causing ever more interaction between the different channels of the PDO, eventually making the whole patch pretty gnarly. For this demo I wanted to produce slightly more traditional synth tones, with various outputs of the PDO used layer up and embellish a simple repeated riff, but without things becoming too gnarly and noise-like (although this does inevitably happen at points, due to some enjoyably over-zealous knob twiddling!). The only synth sounds heard come from a single jam, using the multiple outputs of a single PDO. There are a couple of “special effects” sweeps that appear here and there (eg: at around 02.30, in the background), but that is it. 1. The basic patch is similar setup to Demo 01 in some ways – two channels (1 and 2) of the PDO are centered around producing soft, rounded bass tones based on sines – whereas other channels are more searing and chaotic. 2. Channel 3 is sent via the Schippmann VCF02 to add further modulation to it, and to tame some of the harshness. 3. Channel 4 is probably the most savage of them all – possibly due to the build up of phase modulation in the TBVCA, as each channel feeds into the next. This was sent to a VCA and gated at points. 4. The SUM output was also used earlier on, with a similar gated VCA approach applied to it. 5. The 4ms PEG is providing much of the modulation, with one side being modulated by a slow z8000 4 step sequence to produce predictable(-ish) varied rhythms. This side’s EOR trigger is sent to ping the other side of the PEG, and this is set to a different division, so that it mirrors the first envelope, but at a slower speed. 6. The PEG’s two channels are used to modulate the TBVCA’s CV inputs (which control the amount of Phase Modulation applied by each channel of the PDO to the next), and also to the Schippman filter. 7. Various different filter modes are used at different points during the recording. 9. As you’d imagine, this is where things get pretty chaotic! On this demo I concentrated on short, choppy sounds controlled by sharp, attacking envelopes. 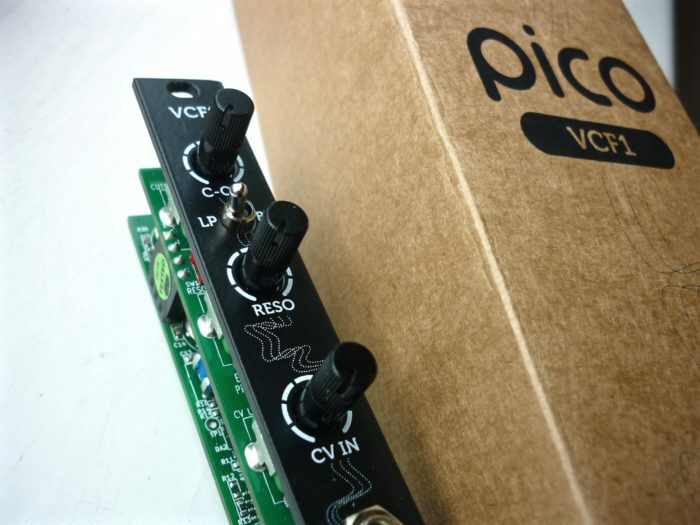 The SYNC on the PDO is also used at points, creating a lovely “phasey” sound, and external oscillators are used to modulate the PDO via the TBVCA instead of merely utilising the internal routing. The only other sound heard is a synth pad from the FXpansion DCAM Synth Squad Amber plugin, which plays the chordal beds which appear every now and then. 1. 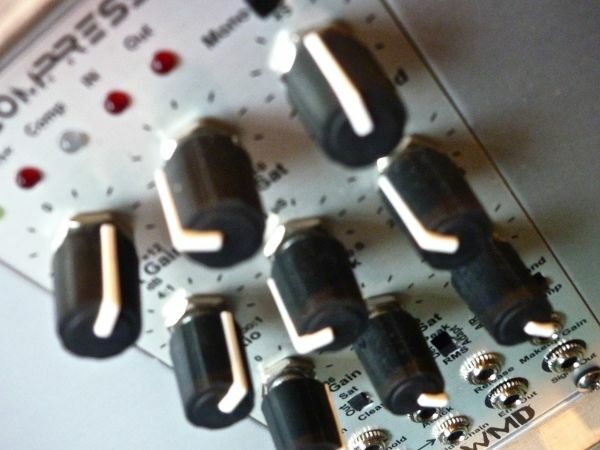 The Vermona FOURmulator quad LFO is used to CV the Triple Bipolar VCA (connected into the PDO) – several different LFOs are combined in a mixer for this purpose. 2. The input into the TBVCA is coming from the Rubicon, and both that and a Dixie are following a sequence from the Moskwa sequencer. 4. The Rubicon’s double Sine is fed back into the TZFM input, and the TZFM INDEX is swept up and down by Maths, adding more interest to the PDO’s Phase Modulation source. 5. The PDO’s Staircase output is also used in this patch, and is sent via my trusty Tiptop z2040 filter. The filter’s cutoff is heavily modulated, and random gates trigger an envelope which controls the z2040’s GAIN. 6. At points I increase the z2040’s resonance into self-oscillation, which only appears when the input GAIN is not being boosted by the envelope. 7. The z2040 is sent via the Modcan Dual Delay, and various controls on both the z2040 and the delay are manipulated throughout. 8. Towards the end all oscillators’ pitches are experimented with, and much strangeness occurs! For this demo I am merely patching intuitively, with no real aim other than to create some cool sounds! The PDO is undergoing some nice filtering too in this demo, and various techniques are employed to grind out some aliased sounds at points. This oscillator certainly has BAGS of character, and imparts a pretty unique sonic signature to most recordings. Definitely a keeper. 5. A randomly-triggered Maths envelope is mixed with an a149-2 random output (via a Maths slew) and used to modulate the Filter’s cutoff. 9. A randomly-triggered z4000 ADSR is used to control the amplitude of the output VCA, and its GAIN is manipulated manually at points. 10. The following controls are also manipulated manually during the recording: Filter cutoff and CV inputs, PEG output attenuator and rate, TBVCA CV inputs, PDO Coarse Tuning. 11. At points the main clock coming from Silent Way/ ES3 is interrupted by muting it. Whilst putting together a suite of commissioned demos for the WMD PDO mk.2 – and associated Triple Bipolar VCA – some of the recordings turned into extended drone workouts. These are collected within this post. Further demos, demonstrating the PDO’s deployment as an LFO will be published soon. For this demo I wanted to demonstrate the sound of the PDO when Linear FM is applied to it. Only channel 1 of the PDO was used, and it was set to SINE throughout. A simple drone was set up, with various modulation and manual tweaking carried out during the recording. I was pleasantly surprised at how nice the FM actually sounds – considering that the analogue saw core of the PDO is shaped by a digital waveshaper, and that the Quad Anti-Aliasing Filter was not used. 1 – PDO ch.1 sine was multed to two VCAs, panned left and right, with the amplitude of the VCAs modulated by 2 different slow LFOs. 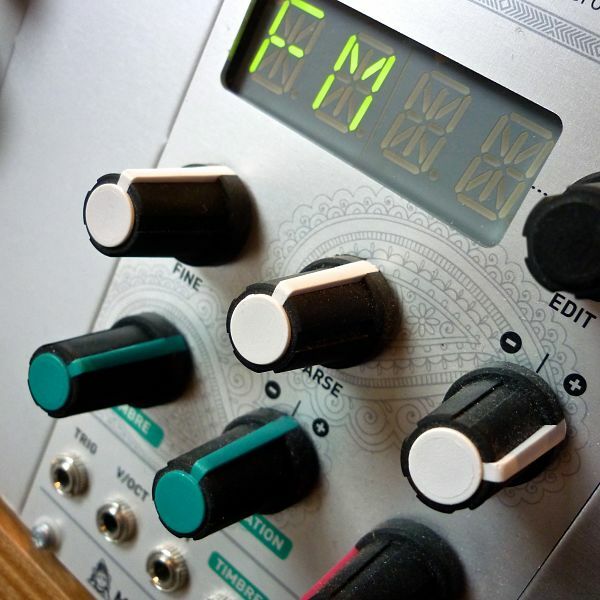 2 – The Intellijel Rubicon is used as the FM source. 3 different waves are used at various points: Sine, Double Pulse, and -2 Octave Sub. 5 – Further FM from the -2 Oct Sub is brought in and out manually at various points. 6 – As the recording progresses the SUM output of the PDO is sent into the Rubicon’s TZFM input, causing FM feedback – which results in a more aggressive and chaotic tone. 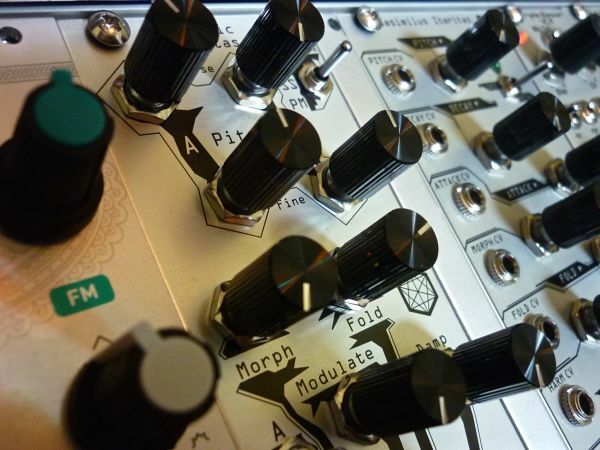 7 – The Rubicon’s TZFM and Symmetry are both manipulated throughout, and modulated by further LFOs. For this demo I again set up some drone action, but this time I am using both Phase Modulation AND FM – with a variety of modulation sources used, some of which are also modulated themselves. Some lovely bell-like tones have been achieved, as has some intense aliased Hertz Donut-esque chaotic noise near the end. It is VERY long, but I was happy with the way it turned out as a single, extended jam with no edits….so I’ve left it as it is. After all – that’s what the SKIP function is for! If you are REALLY interested in this module though – especially in terms of its more mellow/ subtle side – I would advise letting it play through, as you may miss some nice little tonal shifts here and there otherwise. Maybe do some ironing or something…or check your emails! Or browse Muff Wiggler……..
1 – All four channels/outputs of the PDO are fed into attenuators and brought in and out manually during the recording. 2 – A subtle LFO is warbling the pitch of the PDO up and down slightly. 3 – PDO Channel 1 is a simple Sine wave for a lot of the recording, although it alters drastically later in the recording once intense Exp. FM is applied from the Rubicon. 4 – PDO Channel 2 is another Sine which is being phase modulated by PDO Channel 1’s Sine, and a Triangle (at a different frequency) from the Rubicon. The patch is set up so that the Intellijel Planar Joystick controls which wave is the modulator. This is achieved by sending its Y CV output into the Triple Bipolar VCA’s CV input, crossfading between the two modulator waves. This has the effect of adding harmonics and overtones to the purer Sine tone. 6 – Moving the joystick around thus produces a constantly evolving tonal palette, moving from bell-like tones, to Sines, to Saw-like timbres. 7 – TZFM is applied to the Rubicon at various points by a Dixie oscillator, and the Dixie is itself modulated by a Maths LFO. The increased complexity of the Rubicon’s tones thus impacts the PDO’s phase modulation, producing “beating” and dissonant overtones. 8 – The PDO’s timbres increase in complexity again as intense Exp. FM is applied by the Rubicon. The FM is then backed right off to calm things down a little. 9 – The next process to be applied to the PDO is the introduction of a cycling, punchy Maths envelope into the CV234 phase input. This is intensified, and Maths’ Rise and Fall are tweaked until they are up in audio rates, and then brought back down again. 10 – Finally Channel 4 of the PDO is introduced: This is the spiky Triangle wave, and is phase modulated by Channel 3 via an a115 Audio Divider. The various pulse-based sub-octaves in the a115 are brought in and out, and the complexity of the wave being input into it creates some bizarre, clicky timbres. These are further intensified by the re-introduction of savage amounts of Exp. FM. Like I say, it’s not a musical masterpiece, but will certainly show you some nice timbres. Here’s a couple of little demos of the Manhattan Analog THAT-based VCA. I have endeavoured to demonstrate how it responds to a variety of envelope shapes, along with some outright abuse via audio rate Amplitude Modulation. 1. Braids was used as the sound source. 2. The 4MS Pingable Envelope Generator was set up to produce various chaotic, random envelopes. 3. The Doepfer a149-1 was used to modulate the DIVISION of the left envelope, and then the EOR output was sent to the right PEG envelope to ping it – but this envelope was set to half the DIVISION of the left one – this creates an effect whereby one envelope receives its modulation first, juddering away, and then the second one follows a short time afterwards once the EOR pings get through to it. 4. The EOR output of the left envelope was also used to sync the start of Braids’ waveform, via the TRIG input – giving the clicks more consistency. 5. The outputs of the two envelopes were sent into the two CV inputs of the Manhattan VCA, and brought in manually during the recording. The OFFSET on the VCA was also tweaked a little way in, filling out the sound. 6. The PEG’s envelopes were set to Exponential and Logarithmic shapes respectively – as you will be able to hear in the recording, one is much “spikier” than the other. 7. Towards the end I drive the PEG up into audio rates, and some savage AM (Amplitude Modulation) of the VCA occurs. Reverb added during mixdown. No EQ. 1. This quickly became the most chaotic demo so far: Braids was again used as the sound source, but this time it was heavily FM’d by a Piston Honda (can you imagine a more gritty form of FM?). They both crap out at high FM settings, so they are a match made in heaven (or hell, depending on how you look at it..). 2. The TIMBRE and COLOUR of Braids were modulated by the PEG, with the envelopes set up in a similar way to the previous patch – but with even more modulation (of the SKEW, CURVE and DIVISION…). 3. 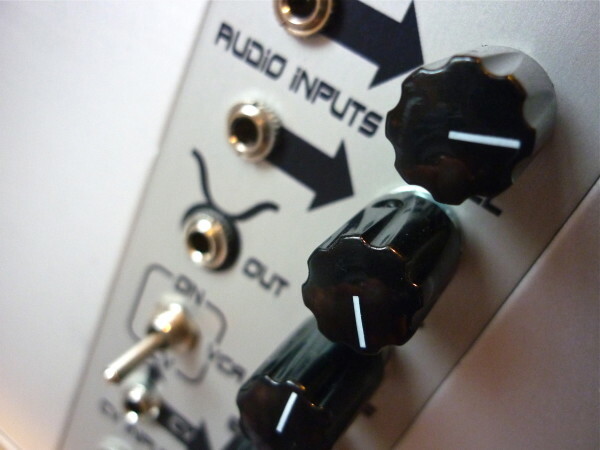 Braids’ main pitch was controlled by an output from the a149-1, which was also providing all of the other modulation sent to the PEG. 4. The Manhattan Analog VCA added the final icing on a fairly disgusting cake, smashing it all to bits with an unhealthy serving of Amplitude Modulation, courtesy of the two PEG envelopes. 5. An a149-2 random gate was used to sporadically toggle the CYCLE of the PEG back and forth from one envelope to the other. 6. To add insult to injury, Braids was put into META mode. For the first five demos I wanted to quickly fire off a number of 1 minute variations on essentially the same patch, in order to demonstrate some of the mA35’s tonal characteristics. 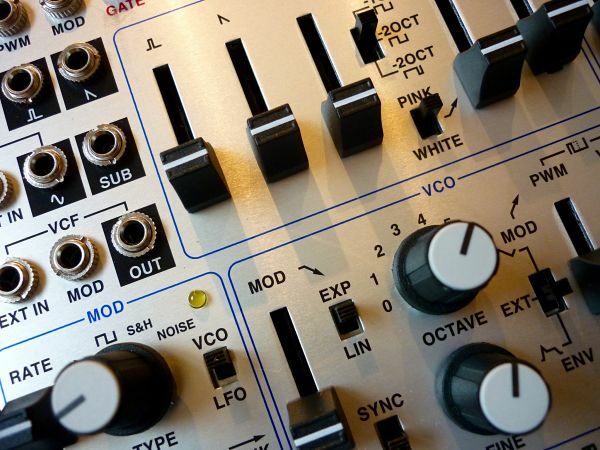 All demos were recorded using the Intellijel Rubicon as the sound source, and centred around rhythmic sequences provided by the Doepfer a155. The final two demos are from a slightly different patch, and centre around the MA35’s self-oscillation and FM capabilities. On this I used the MODE CV input to switch between LP and HP modes, which – when the cutoff is set very low – almost acts as a VCA, cutting the signal in and out. Slight reverb added during mixdown. No EQ. Similar patch to Demo 01, but this time, every time the filter switches to HP mode an envelope is also applied, which adds an upwards cutoff sweep over the top of this change. Slight delay added during mixdown. No EQ. This recording features some OSC Sync action from the Rubicon, and also showcases the internal VCA in the MA35, with a very snappy z4000 ADSR controlling it. This demo kicks off with no audio input to the filter, but instead we hear it self-oscillating. After a while some Rubicon waves are faded in, and some FM applied towards the end. Slight chorus added during mixdown. No EQ. Sound source: Self-oscillation / Intellijel RubiconThis demo shows off the MA35’s FM abilities – initially just acting on the self-oscillating filter itself (FM provided by Maths), and then Rubicon waves are gradually brought in. The frequency of the FM from Maths is tweaked during the recording. This demo shows off the ways in which the MA35 can be used to create interesting sounds, even with no signal input – and also focuses on the Highpass output. All signals were recorded direct, and the VCA used was the internal MA30 one. Some wigglers on Muff WIggler had been discussing how the MA35 has a certain amount of noise in its circuit – well, it DOES…but so did the design that it is a clone of – and also you can put this noise to good use: If you FM the filter, with no signal present at the input, it will produce an output that sounds like a oscillator wave – even with the resonance turned down to zero. Presumably this is the small amount of noise in the circuit being FM’d. As you turn up the resonance, you will gradually morph the signal into something more recognizable as a self-oscillating (FM’d) filter. Bringing in an actual oscillator wave underneath all of this alters the sound again. this filter has bags of character, and I’m liking more each time I play with it. 1. Intellijel Rubicon Sine and Pulse are fed into Input 1 of the MA35, via an attenuator whose level is gradually increased as the recording progresses. 2. The Rubicon’s pitch is controlled by the Turing Machine’s main output. 3. 00:00 – 00:40 – No audio input. This is merely the sound of the MA35 with zero resonance being FM’d by a Dixie Triangle wave, which is following the same sequence as the Rubicon. 5. 01.30 – The waves from Rubicon are finally brought in underneath the FM/Self-oscillation sounds. 6. The MA35’s cutoff is also being modulated via its 1v/oct CV input – by an output from the Turing Machine’s Voltages expander, producing a different, although related, sequence from the main module. This goes through Maths, serving as a slew limiter. 7. The second channel of Maths provides the spiky envelopes that control the MA35’s VCA level. This demo continues in the vein of the previous recording, and shows off the ways in which the MA35 can be used to create interesting sounds, even with no signal input – this time using the Lowpass output. 1. The patch is identical to the previous one, except for the addition of some modulation into the MA35 VCA’s Gain CV input – coming in at audio rates from the Dixie. This is only introduced for the ending. 2. The cutoff of the MA35 is also manipulated this time round, with the combination of low Cutoff and low Resonance creating the growly effect heard from 02:30 onwards. 3. As with the previous recording, various other controls were manipulated – including the slewing of the Turing Machine pattern applied in Maths. This wonderful set of audio demos by Dmod (Damian Salza) shows off the wide range of sounds that can be wrung from the AJH Synth Minimod – a fully-accurate Eurorack clone of the Moog Model D Minimoog. These demos were recommended to me by the synth’s manufacturers themselves, who were very pleased with them, and feel that they really demonstrate the system in a particularly effective fashion. I would tend to agree! In summary – some seriously FAT tones on display. Now available in a wonderful Black livery! 7 – During the final part of the recording the Speed (pitch) of each LFO was manually tweaked. These tracks emerged during some commissioned demo recording sessions of the Frequency Central Raging Bull – a Moog Taurus VCA / VCF clone. Some more basic demos will follow. These demonstrate how the module can be featured as the primary tonal manipulation device, or – in the case of demo 03 – the sole sound source. The first Raging Bull demo is a cheesy/cheeky little track in a “retro” electro vein, which aims to demonstrate some traditional “Moog-like” filter usage – with varying degrees of Resonance, Cutoff, VCA drive etc.. Some lovely rounded “woody” tones are achieved, with the VCA drive adding a pleasing fatness to the overall sound. Some of the patches also have a “brass-like” quality to them. Every bit of filtering you hear in this track is from the Raging Bull, apart from some automated software filtering on the drums. All synth sounds are either running through the Raging Bull, or are created by its self-oscillation. 1. The sound source for the main bassline was the Intellijel Rubicon: Saw, Double-Pulse (up an octave) and Square SUB (-1 oct), fed into a mixer and then into the Raging Bull. 3. The Cutoff ADSR is mixed in CV Tools with the main sequence, so that the filter tracks the sequence. 5. During the recording different balances of the three waves are brought in manually, and the various filter controls (Cutoff, Resonance, Input Level) are manipulated. The filter envelope is also tweaked, as is its polarity (in CV Tools). The Rubicon Double-Pulse’s PW is also manually tweaked. 6. A second sound is used to create an arpeggiated part over the top. This comprises of a Double Saw and normal Saw from the Rubicon, with Silent Way envelopes controlling the Raging Bulls Cutoff and VCA. A slower Maths envelope is also sweeping the Cutoff up and down every 2 bars. The Cutoff and Resonance is manipulated during the recording. 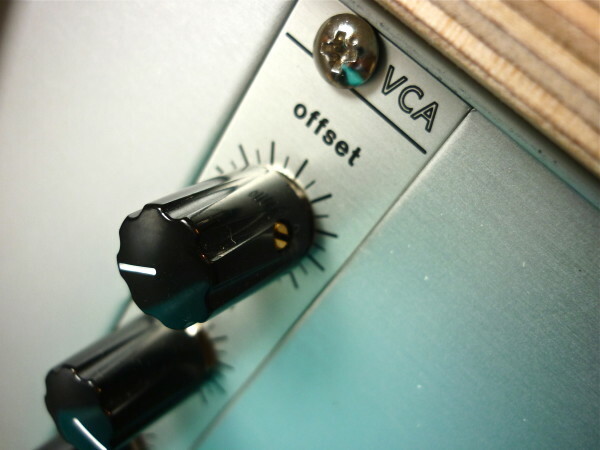 The Silent Way envelope’s Sustain is also automated at various points to make the filter and VCA envelopes more “spiky”. 7. 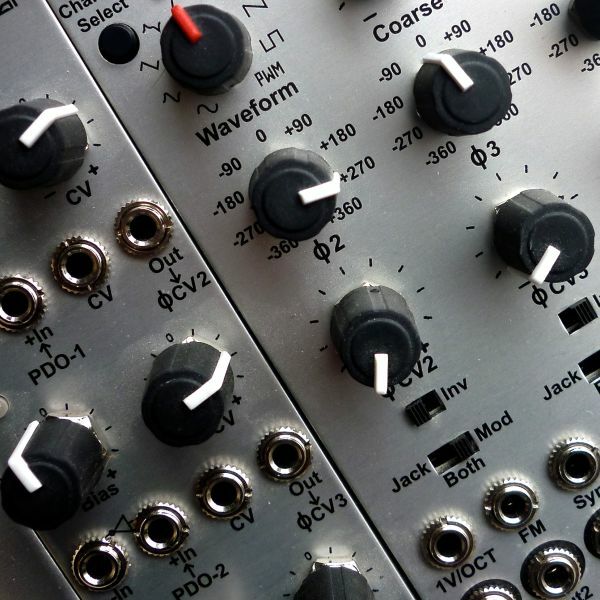 A third sound is derived from the Intellijel Dixie (again through the Raging Bull), and variations on this are used at different points. The main Rubicon bassline riff is sent into the Dixie’s Sync input, with the Dixie itself left to drone on one note. The Rubicon also FM’s the Dixie via its Linear FM input – so it is being Synced and FM’d by the same sequenced Rubicon part. At other points the FM is removed, and a more traditional “Osc Sync” sound can be heard – the part appears to be more static, in terms of pitch. During some sections the FM is manually faded out over a number of bars, leaving the simple droning “Osc Sync” sound. The Dixie’s waves (Pulse and Saw) are then saturated and manually crossfaded within the WMD Multimode VCA. This sound also generates a fourth patch, where the Silent Way envelope is altered to produce a very short percussive sound, almost like a cowbell. 8. The Raging Bull’s self-oscillation was also used to create a part which doubles the main bassline near the end (07.30 onwards), but in a higher register, and employing a strange harmony. Wobbleboard-esque “whomps” appear now and then, with Maths’ whip-like envelopes employed to produce the the self-oscillation pitch shaping. The self-oscillation was also used to track the bassline in order to create a sub-bass (at 00.55), and various bleeps and zaps (06.55 onwards). The latter were created in the following fashion: Initially a re-triggered Silent Way envelope controls the cutoff of the Raging Bull’s self-oscillation; then this is mixed in with a randomly-sequenced Rubicon output to create filter FM; finally the output of the Turing Machine is added to randomly shift the Cutoff up and down. 9. Some additional sweeps – created via modulation/ FM of the self-oscillating filter – were borrowed from Demo 02 and added to bring extra interest to certain sections (see: 01:08 onwards). No sampled sound effects were used at all – just the Bull in full effect! 10. Occasional Highpass Filtering (in software) was applied to the main Raging Bull “bassline” when it plays in the higher octave, but all other filtering is the Raging Bull alone. This Techno-flavoured dance track was put together largely to demonstrate how effective “plucked” synth/ synth bass sounds can be produced with the Raging Bull. I wanted to keep the main riff and sound sources very simple, so that the effect of the filter could be clearly heard. Some additional sounds were added over the top – mainly comprising of the Raging Bull self-oscillating, with various modulation applied to create zaps, sweeps etc.. Further self-osciullation is explored in Demo 03. 1. 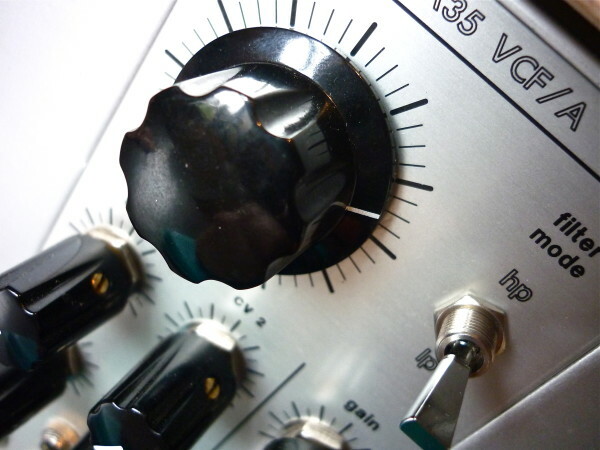 Doepfer a155 was used for the main sequence, multed to the following places: 1v/OCT input of an Intellijel Rubicon (Saw) and WMD PDO mk.2 (Wiggly Saw, up an octave), and also to the 2nd CV input of the Raging Bull to make the cutoff track the sequence. 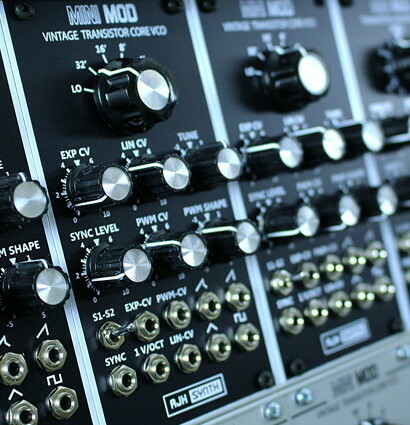 The PDO was synced to the Rubicon, and the Rubicon was synced to the clock pulse to make the clicks at the start of each note regular and even (This is a feature of the Moog Minitaur, where it is called “note sync”. 2. The 4MS Pingable Envelope Generator was sent the main clock and a snappy envelope used to control both the Cutoff and the VCA amplitude of the Raging Bull. This creates an almost Lowpass Gate effect where the modulation of the filter cutoff and VCA amplitude are always linked, and the sharp Exponential nature of the PEG’s envelopes accentuates this approach further. 3. A slowly-cycling Makenoise Function envelope was used to modulate the FM of the PDO as the recording progress, but as the PDO is synced to the Rubicon this produces a nice “phase-like” effect instead of a pitch sweep. 4. The Function envelope was also applied to the CURVE CV input of the PEG at points, making its shape sweep from sharply exponential to a more rounded shape. 5. The various controls of the Raging Bull (Cutoff, Cutoff CV amount, Resonance, and two Input levels) were manipulated throughout. 6. Some additional sounds were added over the top – The self-oscillating Raging Bull was modulated by various envelopes from Maths, so that it produced “zaps”, sweeps and filtered noise from the Cyclebox. 1. Firstly, a snappy Maths envelope was set up in order to create the “kick”. It was set to trigger on each beat, with a second slower Maths envelope subtly modulating its FALL time. 2. The 4MS Rotating Clock Divider was then used to produce a number of different divisions, which were all fed into an a151 Quad Sequential Switch. This was randomly stepped through, with the resulting rhythm providing triggers for a second envelope – the a171-2 VCS clone. 3. The a171-2 was patched into a VCA containing the output of an e350 wavetable oscillator. The pitch of the e350 was controlled by a random voltage from the a149-1 “Source of Uncertainty”, with another of the a149-1’s outputs modulating the wavetables. 4. The a171-2’s RISE and FALL times were modulated by further a149-1 random voltages, so that they changed from snappy “zaps” to softer “swooshes”. As these were applied to the VCA containing the e350’s output, the result was an ever-changing series of rhythmic oscillator “FM stabs”. 5. 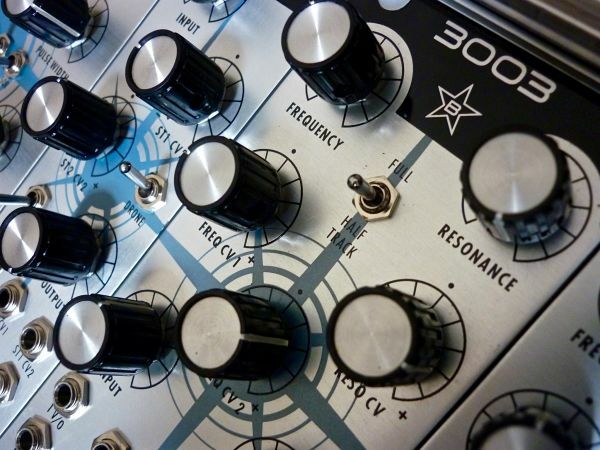 The e350 VCA’s output was fed into a mixer, along with the Maths “kick” envelope, and the second slower Maths envelope which was brought in to add movement to the low end of the self-oscillation, providing a bendy “bassline” drone. 6. The output of this mixer was fed into the Raging Bull’s Cutoff CV input, so that – by the end of all this patching – the filter was modulated by a mix of “kicks”, bendy bass drones and e350 “FM stabs”. 7. The Raging Bull’s output was recorded dry, and also processed by the Modcan Dual Delay, set to “stereo”. 8. The Dual Delay’s internal Lowpass Filter was modulated by the SUM output of the Vulcan Modulator – and its various Delay time and Feedback CV inputs were modulated by another output from the a149-1. 9. During recording virtually all the available controls were manually tweaked: the levels of the various cutoff modulation sources; the rates of the Maths envelopes (which were pushed into cycling at audio rates towards the end); the Raging Bull’s main Cutoff; the Dual Delay’s feedback and filter cutoff; ….and probably more things I’ve forgotten about! It’s all a bit erratic, but was an interesting exercise in seeing how much material can be generated from a self-oscillating filter alone…and also demonstrates how well the filter will FM and respond to CV sources. It will also do a pretty good job at creating a kick drum! Bear in mind that you will need some decent monitoring to even be able to HEAR some of the sub-bass in this recording.. Right. This started out with the intention to do a fairly straightforward demo of the Intellijel Atlantis, and using a technique I wanted to try out whereby 4 different random gate outputs of my Doepfer a149-2 were fed into a mixer and turned into a “pseudo-sequencer”, with the mixer’s output feeding various 1v/oct CV inputs. I also wanted to see how the Atlantis integrated with the rest of my Eurorack modular system. But you know how it is – things pretty quickly went in a fairly chaotic direction, with bags of processing applied in a variety of often unpleasant ways! It’s definitely very nice having what is essentially a monosynth in the middle of your system, but due to its immense patchability it begs to be abused. It is almost as if it is daring you to turn it into something that buries its traditional origins and takes it off in an altogether more experimental direction. I often used to find this with the MFB OSC02, and got some amazing sounds from it that belied its fairly limited user interface and synthesis options. So….what I’m trying to say is: don’t expect a clear and concise demo of the Atlantis in its naked glory! This is more a demonstration of how it can perform as the centerpiece to a rather more elaborate patch. The original patching was undertaken on the first day, but upon returning to it a second time I had almost completely forgotten the original purpose of the patch and decided to slow it all down to a crawl, adding various Slew Limiting to the main sequence. 1. A Random LFO wave was selected in Silent Way’s LFO plugin, offset so that it was positive-only, and used as a clock source for the a149-1 random module. It was also blended with one of the a149-2’s random gate outputs in an a166 Logic module, to provide an even MORE random stream of gates/ clocks for the Turing Machine and the Atlantis’ Envelope GATE input. 2. As mentioned earlier, I combined 4 random gate outputs from the a149-2 in a mixer, adjusting each channels level so that the output produced a random sequence when fed into an osc’s 1v/oct input. This gets pretty interesting with the a149-2, as the gates overlap at points, with the result that the voltages created by the mixer’s channel pots are summed together, adding more variety to the sequence. The use of this technique means that you gain control over the pitches output by the a149 combo, rather than them being completely random (as they are when using the a149-1’s main outputs). Hope that makes SOME sense! 3. The “pseudo-sequencer” outputted by the mixer was sent into a Makenoise Function to add voltage-controlled Slew Limiting to it. The Function’s RISE and FALL times were modulated by 2 different outputs from the erratically-clocked a149-1. 4. The output of the Function was fed – via a Buffered Multiple – to the following destinations: The Exp. CV input of a Pittsburgh Modulator Generator (modulating the PWM of the Atlantis); the 1v/oct inputs of the Atlantis’ main OSC and Modulator OSC; and the 1v/oct input of a WMD PDO mk.2, which is used as a modulation source for various parameters. The PDO was also SYNCED by a random gate output from the a149-2. 6. The -2 OCT SUB was fed – via an attenuator – into the Pittsburgh Modular FIlter, and the L-H output was then fed into an RYO Optodist (to add distortion and limiting to the erratic levels of the Filter). This was then fed into the left hand side of the MMVCA, and crossfaded with the Atlantis’ Pulse signal by a slow LFO. The outputs of the MMVCA were both recorded separately, and panned to produce an “Autopan” effect. The Filter’s Resonance and Cutoff were modulated by different outputs from the WMD PDO. 7. The Atlantis’ Pulse channel – now located in the right hand side of the MMVCA – was fed via a Makenoise Echophon for further processing before recording, and the ECHO, PITCH and FEEDBACK were modulated by further LFOs from the WMD PDO and Quadra. 8. A third sound was created using the Atlantis exclusively: It was mainly a SINE wave from the main OSC, which was FM’d by the Modulator OSC (at audio rates) via a VCA. The VCA’s level was modulated by a slow Maths LFO, causing the FM to sweep in and out. The Lowpass filter was used on the Atlantis, controlled by Keyboard Tracking and its randomly-triggered, “pluck-like” envelope. The end result was not too dissimilar from a Lowpass Gate, as the Amplitude and Filter Cutoff were both being modulated in tandem. The Output VCA was set to its middle CLIP position, to add warmth and some soft limiting. At points the -2 OCT SUB was mixed in with the SINE at a low level. SO….basically what we end up with is two autopanning, gnarly Pulse-based sounds stemming from the Atlantis – one through the Echophon at points, and the other filtered and distorted to oblivion, underpinned by a low, plucked “pseudo-LPG” sound. During the recording various controls were manipulated – Atlantis: Mod OSC Frequency; PWM Amount; SUB OSC level; LPF Cutoff, Resonance, 1v/oct amount and ENV amount (going into enveloped self-oscillation towards the end to produce some nice, kick-like tones). PDO, Maths and Quadra: All their frequencies were manipulated at various points – often into audio rates – and the Maths LFOs were altered so that they became very sharp, exponential “plucks” which speed up and slow down gradually. Pittsburgh Filter: Cutoff, Mode (swept from LP to NP to HP), modulation amounts (Cutoff and Resonance), Resonance, along with attenuation on the way into it. Echophon: modulation intensities (ECHO, PITCH and FEEDBACK); and the main PITCH, and MIX were pushed into growly territory towards the very end of the recording. Pittsburgh Generator: the main pitch was altered at points, creating varied results on the Atlantis’ PWM. Phew….that was complicated! Was it worth it? – you be the judge! 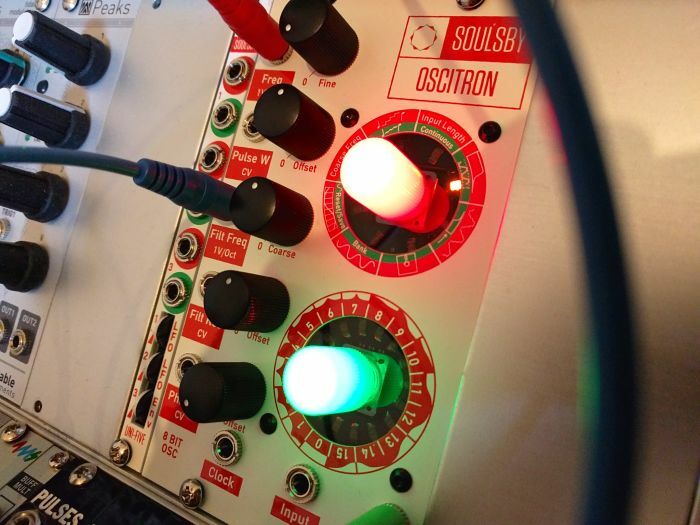 These demos represent the range of sounds wrung out of the Soulsby Oscitron 8-bit wavetable VCO, over the course of the first few hours playing with the module, with little reference to the manual. Much fun was had! This demo gets a little more crazy. It started out as an attempt to show how the filter sounded like with Normalize turned ON (can sound a bit cleaner and more “pure”…relatively speaking! )…but it quickly dissolved into abstract noise territory, but in a good way 🙂 I decided to add some drums and production, just to give it some context. 3. For all previous demos the Square Wave was used (default sound), but this time I switched to wave 2 (GREEN) which produced a much brighter, more distinct tone. 4. Various tweaking of the VCA’s Gain (offset) control was applied, to change the patch from droning to rhythmically-triggered…and many other controls were manipulated during the recording in order to smash the riff into oblivion. 5. Oscitron was sent via some sidechain compression and convolution reverb was automated on & off throughout the mix. 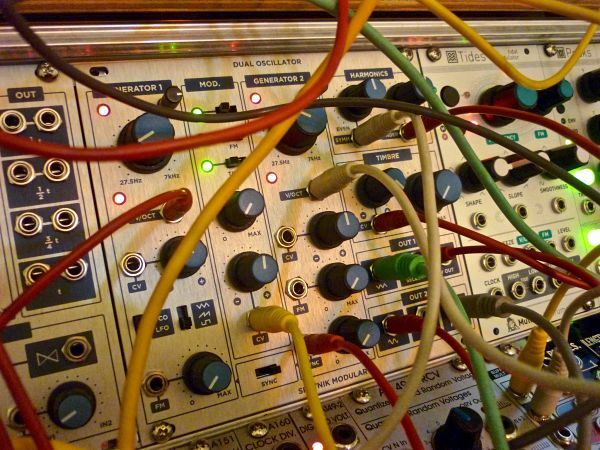 Well here’s a little patch that I came up with whilst experimenting with the Mutable Instruments Braids oscillator – combined with the Pittsburgh Modular Filter and the WMD Multimode VCA. As the Pittsburgh Filter doesn’t have any way of controlling the balance between Lowpass and Highpass when in LP-HP mode (which essentially creates a Notch Filter) I initially wanted to see how it sounded when I fed the LP and HP into the WMD Multimode VCA (MMVCA) , using a CV source to crossfade between the two channels. It worked pretty damn well actually, and you can adjust the amount of crossfade so that it is either a complete fade between them, or just a subtle shifting of balance. Whilst setting this up, using a Livewire Vulcan Modulator LFO to control the crossfade, I then decided to use the same LFO to sweep the Filter’s cutoff up and down, so that it didn’t make the sound disappear so much when going between the two filter modes (as it sweeps to the Lowpass the cutoff goes up, and down when it fades to the HP – which worked out well). Next I used a second Vulcan LFO to sweep the Resonance of the FIlter up and down at a different rate. As the FIlter was fed into the MMVCA, I could use the in-built saturation of the VCA to rein in any excessive resonant peaks by driving them into more of a “distorted 303” kind of tone. Then I turned my attention to Braids, using a slow Maths LFO to sweep the Color up and down, whilst also switching it over to controlling the Timbre. Initially I started out with a different mode on Braids, but when I switched to the “/|/|_|_|_” mode it really came to life, sounding almost like a granular synthesizer at points. Lord only knows what was going on half the time, but it sounded so cool I just HAD to record it! The manual describes the mode as this: “This model generates a sawtooth waveform, and sends it into a comb filter (tuned delay line). The frequency of the delay line tracks the frequency of the sawtooth oscillator, with a transposition controlled by the TIMBRE knob. COLOR selects the feedback amount and polarity: at 12 o’clock, no feedback is applied. From 12 o’clock to 5 o’clock, positive feedback is increasingly applied. From 12 o’clock to 7 o’clock, negative feedback is progressively applied.” Whatever it is, it sounds mental. Pittsburgh Filter’s Cutoff + Resonance/ Resonance + Cutoff modulation amounts. No effects used, as I wanted to show the modules off without too much processing. This is the final of three sets of commissioned demos for the WMD Compressor – a product whose beta-testing and development stages I was involved in. These demo look at the less obvious applications of the various functions available on the module, such as voltage-controlled Makeup Gain and the Envelope Out. This time I start off with a basic pumping side-chain patch, and then gradually introduce some modulation of the MAKEUP GAIN. 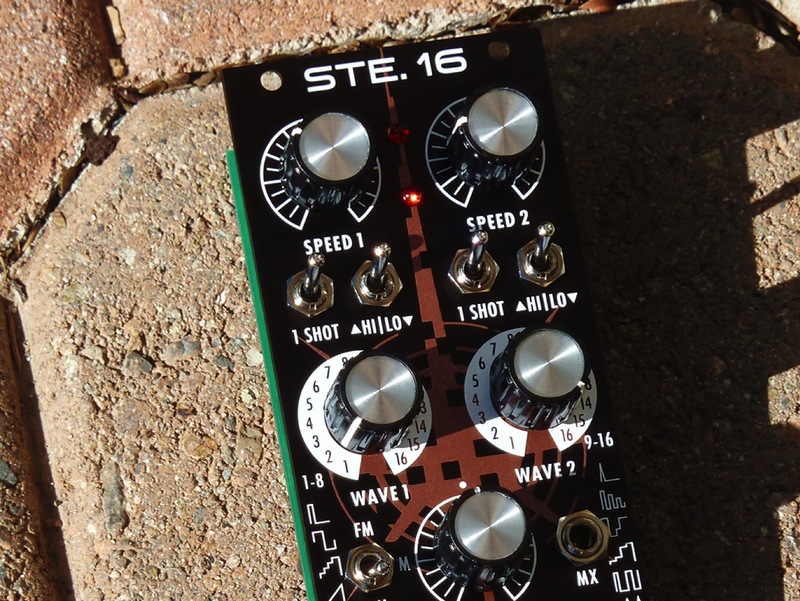 The modulation source is the 4ms PEG, and it is firing off punchy envelopes on 16th beats. As the amount of MAKEUP GAIN modulation is increased (by turning up the output attenuator on the PEG’s envelope) I also change the Curve of the PEG from Exp to Lin. Settings: The DETECTION switch is set to ADAPTIVE, and the KNEE set to HARD. OUTPUT SATURATION is on. This demo has similar settings to the previous track – “Makeup Gain Modulation 1”) – but this time with a slower triangle shaped wave from the PEG controlling the MAKEUP GAIN, creating an additional pulsing on top of the already pumping side-chain effect. Again, you’re basically getting some lovely voltage-controlled overdrive on top of the compression characteristics. This recording demonstrates how the module can also be used as a lovely sounding vca. Compression was also applied to the signal, and OUTPUT SATURATION switched on. An envelope from Maths is used to modulate the MAKEUP GAIN. Each recording consists of two runs through the riff, and on each new recording the output attenuator on Maths is boosted, driving the module further into the OUTPUT SATURATION. During each recording I also gradually change the curve of the Maths envelope from Exp, through Lin to Log. On this recording Maths was set to cycle at audio rates, and its cycle length was modulated by the same sequence that it producing the main riff. Maths’ envelope output was then used to produce AM (amplitude Modulation) on the WMD Compressor, via its MAKEUP GAIN CV input. The MIX control was used to gradually fade from the DRY signal to the processed one. Finally the output of Maths’ envelope was gradually increased to drive the WMD even more. This time the Envelope Out of the WMD Compressor is used to modulate the cutoff of the z2040 Lowpass filter (The oscillators are going through this before they reach the compressor). The shape of the envelope is created by the ATTACK and RELEASE settings on the compressor, and the two elements (the compression and filter envelope) seem to gel well together, as they share the same character and shape. Settings: The DETECTION switch is set to ADAPTIVE, and the KNEE set to HARD. No INPUT or OUTPUT SATURATION. This is another recording utilizing the ENVELOPE OUT of the WND Compressor. This time I have set up a pumping side-chained compressor patch, and am using the envelope created by the pumping of the side-chained compression to control the cutoff of the z2040 filter. First of all you hear the synth dry, then I bring in the pumping compression, and then I bring the filter’s cutoff down manually. After that I introduce the ENVELOPE OUT from the compressor into the CV input of the filter to control the cutoff. I have run the Envelope Out via CV Tools, so that I can invert it when desired. About half way through the recording I do just that, and the filter’s cutoff now mirrors the pumping of the compressor. A neat trick! This is the second of three sets of commissioned demos for the WMD Compressor – a product whose beta-testing and development stages I was involved in. This time round the emphasis is on synth compression, with demonstrations of how the module can be used to enhance transient attack, or create rhythmic interest through external sidechain triggering. This demonstrates how you can add a lovely bite and spikiness to otherwise flat-sounding synth parts. Four bars of the dry signal are at the start, and then every four bars after that I change the compressor settings, adding more compression each time (lowered THRESHOLD, higher RATIO). ATTACK and RELEASE were set to be very fast. The second recording is an extended version, where I have set the compressor for some ridiculously spiky compression, and then I gradually blend in the dry signal using the MIX knob, eventually returning to the completely dry signal. On this last recording I have set the ATTACK and RELEASE to absolute minimum to create the spikiest sound possible. Settings: The DETECTION switch is set to ADAPTIVE, and the KNEE set to HARD. 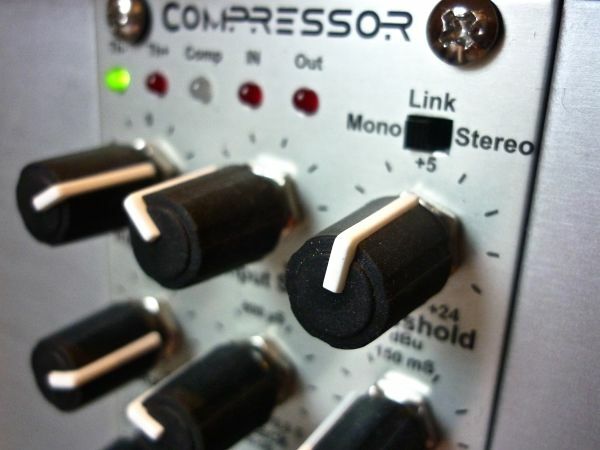 For this recording I wanted to demonstrate how the WMD Compressor can be used to create rhythmic pumping effects, as found in many modern dance music productions. I sent a recording of a click track – following the “4 on the floor” kick part – into the SIDE CHAIN input of the Compressor. The first run through the riff is dry. After that, the THRESHOLD is lowered each time the riff repeats, and the RATIO turned up. The is altered at points to affect the “swing” and intensity of the pumping effect. Settings: The DETECTION switch is set to ADAPTIVE, and the KNEE set to HARD. No INPUT or OUTPUT SATURATION was applied. This demo is intended to demonstrate the lack of distortion when compressor is pumping heavily. The settings for this recording are the same as the previous track – “External Sidechain Pumping Compression 2 (synth)” – but this time with OUTPUT SATURATION switched on. Each time the riff repeats the MAKEUP GAIN is boosted more. The OUTPUT SATURATION was set to 3 o’clock for most of the recordings. On the last version of the riff you can hear the difference when it is turned up to almost maximum. There is a loss of level once you go right up to maximum, so it’s best to keep it just below this. The saturation takes on a brighter tone in this area though. The technique used in this recording is very useful, as you essentially get voltage-controlled overdrive – The OUTPUT SATURATION only kicks in once the signal has come back up after being ducked by the side-chain. This can be useful to add harmonics to subby bass sounds that can often be hard to hear on smaller speakers, and it also makes it easier to tell what note they are playing. This is the first of three sets of commissioned demos for the WMD Compressor – a product whose beta-testing and development stages I was involved in. These first demos all use the same drum loop, in order to provide a clear example of the compression modes being used. This was intentionally repetitive, as often compression differences are very subtle. This demo contains one recording which comprises: 4 bars DRY, alternating with 4 bars compressed. Settings were RMS, Hard Knee, with pretty fast Attack and Release. This demo shows off the INPUT Saturation. Settings are RMS, Hard Knee. There is a gap of 1 bar between each recording. The first recording has 4 bars of DRY, followed by 4 bars with INPUT SATURATION engaged to a moderate degree, followed by 4 bars with INPUT SATURATION engaged to a higher degree. The second recording has 4 bars of DRY, followed by three sets of 4 bars, each with lots of INPUT SATURATION, but each time with increasing RATIO and lowered THRESHOLD settings (more overall compression). This time we’re looking at the OUTPUT saturation available. Settings are RMS Compression, HARD knee. There are gaps of 1 bar between each recording. The first recording has 4 bars of DRY, then a gradual increase of OUTPUT Saturation until just before it starts breaking up into distortion completely. The second and third recordings contain 4 bars of DRY, followed by 4 bars of compressed signal, followed by 4 bars of the same settings with OUTPUT saturation engaged. The fourth recording demonstrates the Signal to Noise ratio when VERY heavy compression applied, along with high IN and OUT saturation settings. This was done to emphasize that a lot of the background noise/ hiss you can hear on this loop at high compression/ saturation settings is actually present in the loop itself, and not caused by the module itself. You can hear any background noise generated by the module (and my system) directly after the end of the last recording – I left it recording for a short while to demonstrate. Demo of the various DETECTION modes available. There are FIVE different sets of recordings, with different compressor settings each time. There is a gap of 1 bar between each recording. Each recording contains 4 bars each of RMS, ADAPTIVE and PEAK. No Dry recording, as this is merely to compare response of the different DETECTION modes. This demo introduces the MIX control. There is a gap of 1 bar between recordings. Each recording contains 4 bars fully WET, followed by 4 bars DRY, followed by 4 bars which are a MIX of the two..and finally 4 bars of DRY again for reference. The first recording utilizes very fast attack and release times to crush the drums. Mixing this with the DRY signal brings up the perceived “body” of the drums, but preserves the natural sound of the DRY signal. The second recording focuses on bringing out the attack of the drums without changing the overall sound of the DRY signal. The WET signal is virtually ALL attack, achieved by higher attack settings and extremely high compression RATIO/ low threshold. As with the 3003 demo, this recording was put together quickly to demonstrate the general “vibe” of the Boomstar Modular 4075 Filter. It uses a very similar patch to the 3003 demo, with a few minor alterations. As with the 3003, the filter is very detailed and oozes quality. Again, the input control makes a huge amount of difference to the sound, giving you a much broader palette of tones than you would get from the original. These demos tackle the new Dual Oscillator from Sputnik Modular, based on a classic Buchla design, and capable of some serious mayhem. In these recordings I mainly wanted to see if I could use it in a “musical” context, rather than abusing it to create insane noises. The FINAL output is the star of the show, producing a sound reminiscent of a distorted, feedbacking guitar at points. Certainly capable of some very organic timbres. 1. A sequence was set up on the Korg SQ1, using the CV Duty mode, and sent to the Dual Osc’s Generator 2 1v/oct input. 2. Gen 2’s FINAL output was mixed with its Sine output in a bipolar mixer. The phase of the Sine was inverted, as this produced a better result when mixed with the FINAL wave. 3. The mixer’s output was fed into a VCA, controlled by an envelope triggered by the SQ1 and recorded direct, producing the higher “melody” line. 4. Generator 1 was used to produce a bassline, with its Triangle wave sequenced from Logic via Silent Way/ ES3. Its output was fed into a VCA, controlled by the envelope from Silent Way. This was recorded direct. 5. Generator 1’s Square output was also used – via a VCA – and fed into the SYNC input of Gen 2. This meant that the SYNC of Gen 2 was only active when Ge 1’s notes were triggered from Silent Way – allowing the SYNC to fall away in between times. 6. Various erratic modulation shapes were created in the 4ms PEG (which seems to make it into every patch I ever do) and used to modulate the HARMONICS and TIMBRE sections of the Dual Osc. 7. Some additional modulation was set up using the internal mod bus on the Dual Osc, and controlled by a slow LFO. Some EQ and effects (reverb, delay) were added during mixdown, and the bassline was processed by the Audio Damage Vapor chorus plugin, and double-tracked. This second demo is a variation on the patch used in Demo 01 – but with slightly more/ different modulation and tweaking during recording. This demo was put together to quickly demonstrate the general “vibe” of the Boomstar Modular 3003 Filter. The filter is very nice – as are all the VCFs in this range – and the input control makes a huge amount of difference to the sound, giving you a much broader palette of tones than you would get from the original.